This beautiful family resort offers Guests a multitude of amenities, dining options and luxurious accommodations. Maximum Occupancy: Four Guests, including children and infants. Room Amenities: This room type has 20 rooms that are ADA accessible. View: Garden or lagoon view. View: Ocean view, pools or lagoon (depending on building). Maximum Occupancy: Four adults and one child, or two adult and three children ages 4 to 17 and infants 0 to 3 years. NOTE: The Signature Family Suite is ONLY available for families traveling with children. Maximum Occupancy: Six Guests, including children 4 to 17 years and infants ages 0 to 3 years. Set on the easternmost tip of the Dominican Republic in Punta Cana, this resort offers 12 different outdoor pools with gorgeous views of the Caribbean Sea and a secluded lagoon. Located 35 kilometers from Punta Cana International Airport. 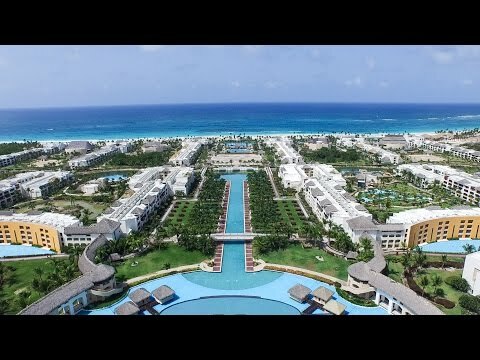 The majestic Hard Rock Hotel and Casino Punta Cana brings unique all-inclusive luxury to the Dominican Republic. This beautiful family Resort offers Guests a dazzling oceanfront property featuring a multitude of amenities, superb dining options and luxurious accommodations. The Simon Manison Restaurant and Supper Club is now open. It is not included in the all-inclusive experience or the resort credit promotion (fees and restriction will apply). Thirteen Pools including three kids pools, a lazy pool and Eden pool, an iconic adults only pool. Rock Spa offers 48 treatment rooms, hydrotherapy facilities and a co-ed vitality pool, plus Posh Beauty Salon and Boutique (fees apply). Golf: On-Site Mini-Golf and a 18 Hole Jack Nicklaus Design Golf Course (fees apply). ORO Night Club - Best parties in Punta Cana. The ORO nightclub will be closed on Sundays, days of operation will be Tuesdays through Saturdays an additional fee of $15 entrance fee will apply and paid directly to the resort, this includes a welcome cocktail of Vodka, Rum or Whiskey. NEW 2019 Added Value, Limitless All-Inclusive Credits: Bookings made by December 20, 2019 and Travel January 6 - December 21, 2020 with a minimum of 3 nights stay guest will receive the Limitless All-Inclusive Promotion. Applicable credit amount per room category are given at time of check-in. Limitless Resort Credit can be used towards selected tours, Rock Spa sessions, beauty salon services, romantic and special dinner events, Rock Shots photo packages and much more. Service Fee: A 25% service fee will apply over the final price of all transactions using the Limitless All-Inclusive Promotion on all services or products. Service fee can only be paid with cash, room charge and credit card. Property will charge for a deposit upon check-in for any extra charges generated. If not used, the funds will be released upon check-out.